Once again, Kilmeena G.A.A. hosted another extremely successful and enjoyable Valentine's Dinner Dance in the Woods Hotel with an attendance that exceeded expectations. This year’s guest speaker was Mr. Michael Ring, Minister of State for Regional Economic Development. After extending a warm welcome to special guests, Rev. Fr. Charlie Mc Donnell , Adm. Westport, Minister Ring and the Club fraternity, the Chairman, Mr. Willie Keaveney, continued his address and outlined progress during 2016. There was an obvious echo of delight and pride in his oration as he announced the completion of the new building which incorporates a gymnasium, two dressing rooms and storage facilities. The electronic scoreboard has been installed and is ready for activation. 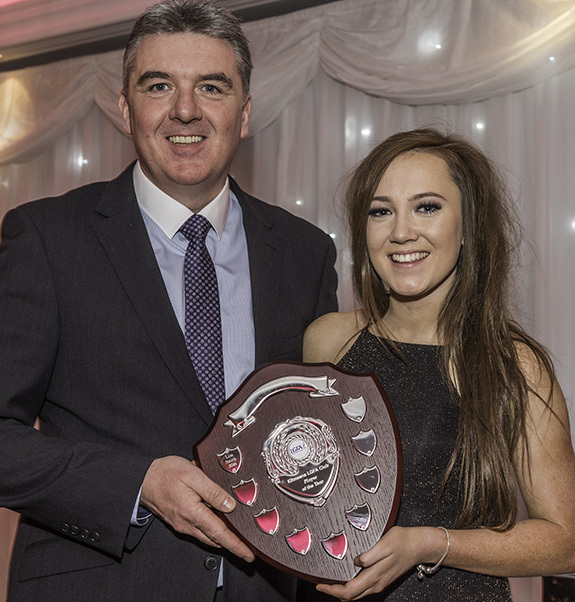 He extended his gratitude to the Barrett family, Drunnagh, for the presentation of the new Barrett Memorial Shield “Young Player of the Year” and to the Cleary family, Bristol, England and originally from Drimard, who presented the “Cleary Brothers Memorial Shield” which will be awarded annually to the “Player of the Year” in Ladies football. The sponsorship of two shields for the Ladies football by Mr. Robert Grealis was also acknowledged. The Chairman extended his personal gratitude to his fellow officers, team management at all levels, lotto teams, sponsors and volunteers for their continuous support throughout the year. A very loud applause resounded when the Chairman thanked Minister Ring for his allocation of €80,000 to Kilmeena G.A.A. Club last year. While the football season did not result in silverware, the Chairman commended the players and management for their dedication, commitment and their dignity on the field of play. 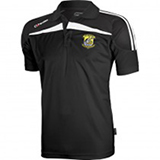 He also congratulated the victorious Mayo Masters Team that won the All Ireland Masters in December 2016. The Club are very proud of the five members who participated , Pat Mulchrone (Captain), Darren Madden, James Prenty, Declan Ryan (Captain 2015), and Kieran Hastings “Man of the Match” in the final. A note of thanks was also expressed to the management and staff of Woods Hotel for their professionalism and efficiency. 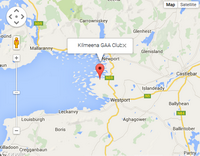 Minister Ring spoke with admiration of the success of Kilmeena G.A.A. Club. He complimented the Chairman for his foresight and the success of the current project which has surpassed many other rural clubs with a similar demography. 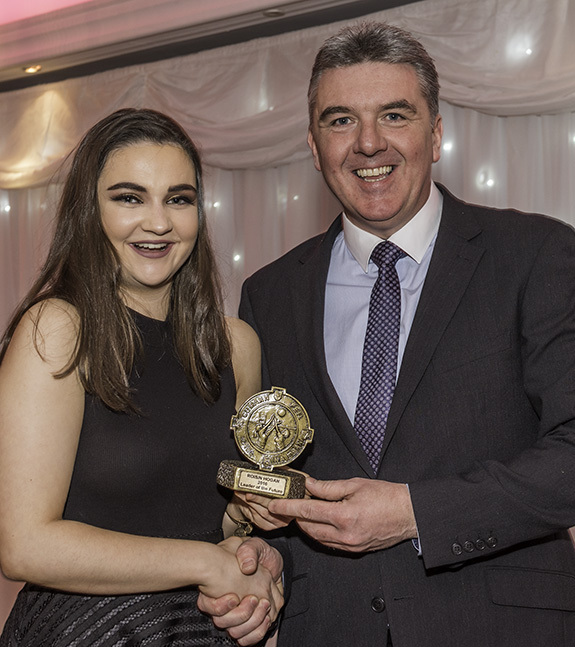 This year’s award was presented to Kilmeena G.A.A. Club Chairman, Mr. Willie Keaveney. It is a befitting tribute and acknowledgement of a Chairman that has certainly lead by example. He has been relentless, scrupulous and meticulous in his implementation of the 5 Year Development Plan and the completion of the current project. His contribution has been invaluable and has undoubtedly ensured that Kilmeena G.A.A. Club has successfully reached another milestone in its long distinguished history. 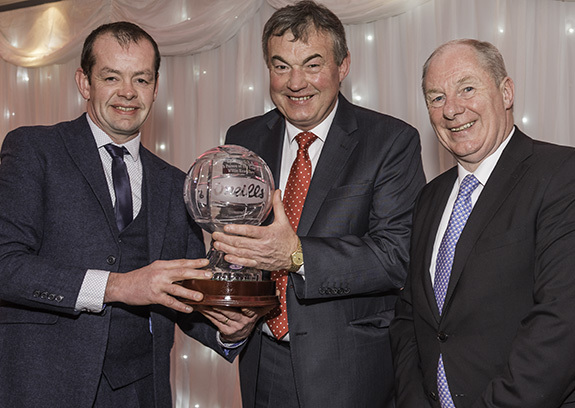 Club Chairman, Willie Keaveney, accepting his "Clubman of the Year" award, from Rory Smyth, Mid West Furniture, Club Sponsors, with special Guest Michael Ring, Minister of State for Regional Economic Development. 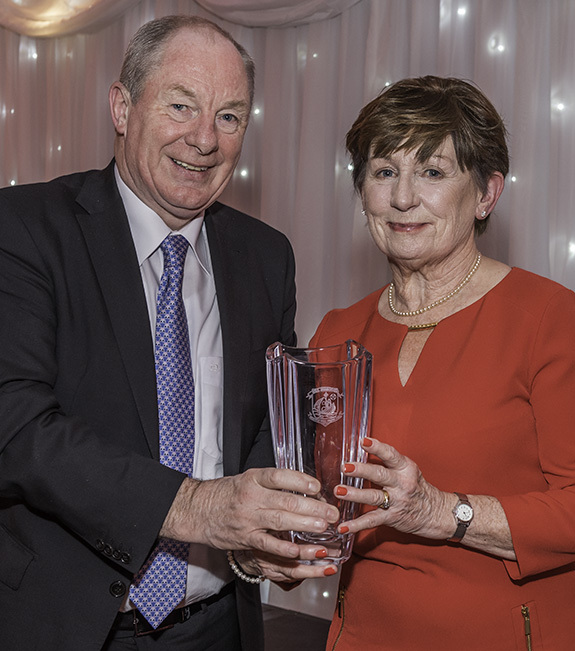 Special guest, Michael Ring, presents Ann Duffy with her "Community Award"
"Player of the Year", Lisa Smith accepting the "Cleary Brothers Memorial Shield" from Bord na nÓg Chairman, John McDonald. 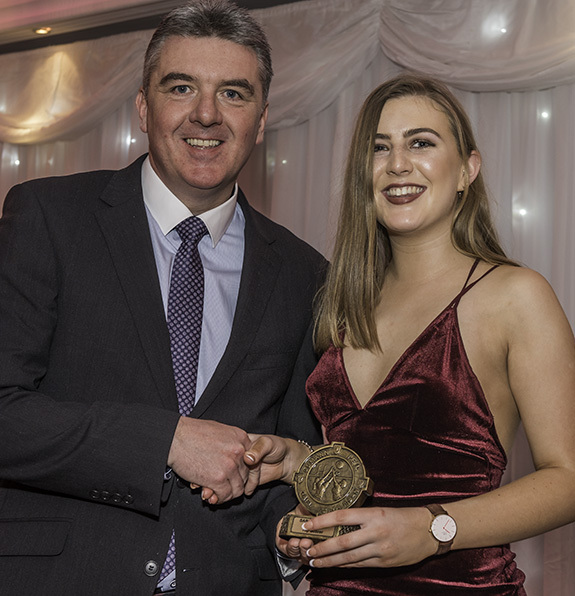 Bord na nÓg Chairman, John McDonald, presents Róisín Hogan with her “Leader of the Future” award. 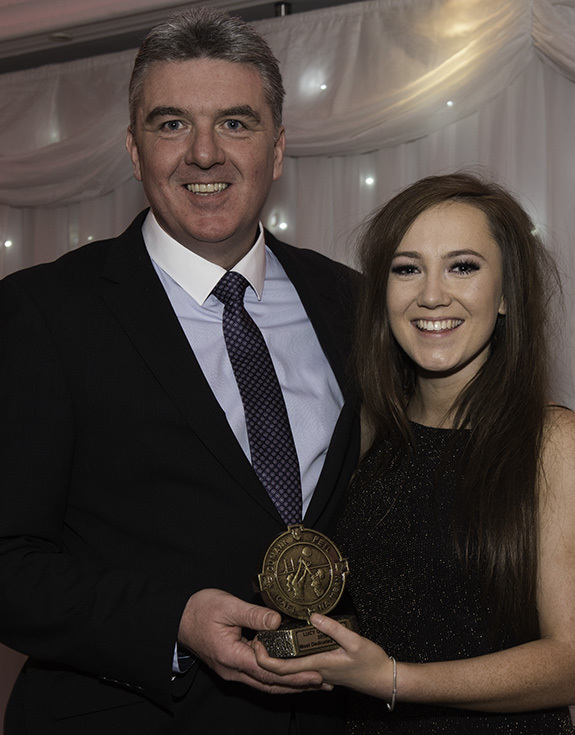 "Top Scorer for 2016" Sarah Hogan proudly accepting her award from John McDonald. 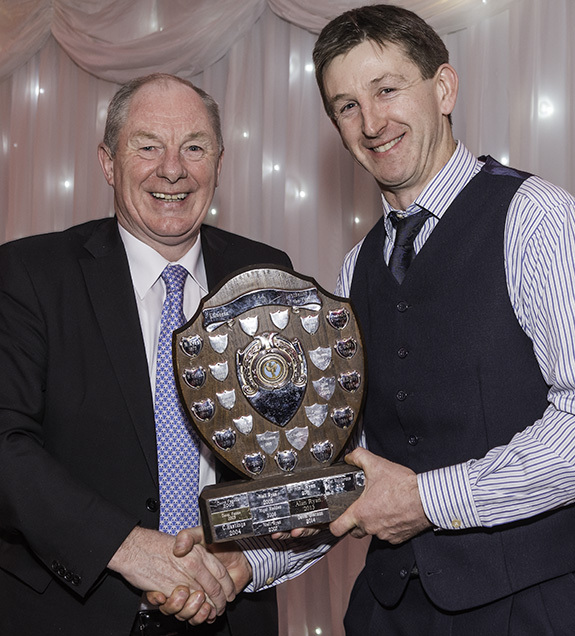 Kieran Hastings accepts his "Senior Player of the Year" award from special guest Minister Michael Ring. 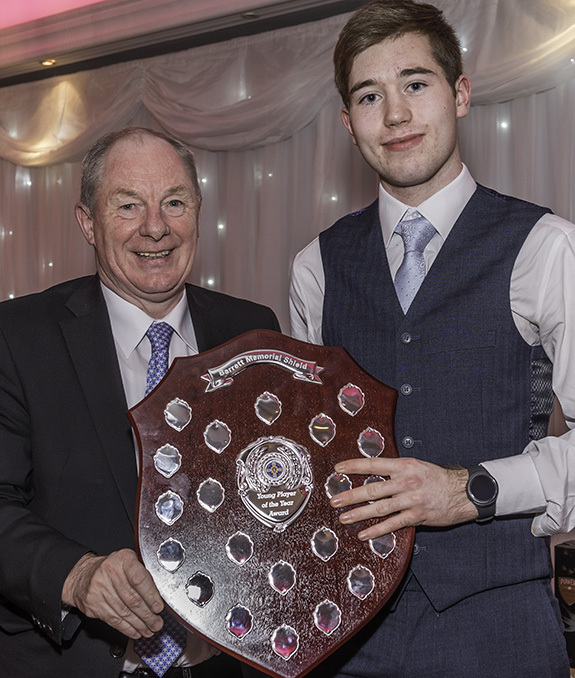 "Young Player of the Year" Conor Madden, receives the Barrett Memorial Shield award from Minister Ring. 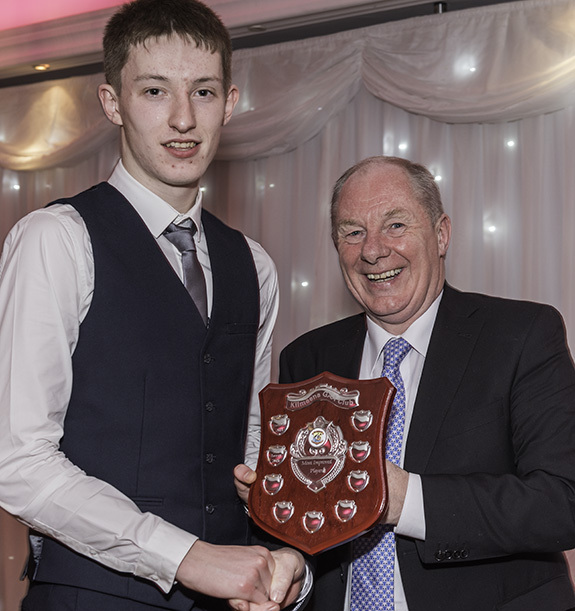 Minister Michael Ring, presents Joey Smyth with his "Most Improved Player of the Year" award.